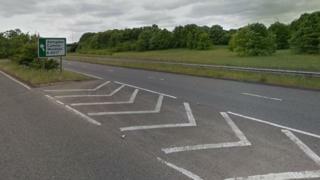 A motorcyclist has died in a crash involving a car on a dual carriageway in Oxfordshire. It happened on the A420 near the village of Cumnor at about 14:00 BST on Monday. The rider of a blue Suzuki GSX motorbike, a man in his 30s from Swindon, sustained fatal injuries and at died the scene. Thames Valley Police said his next of kin has been informed and is appealing for witnesses to come forward.